The Customizer of WordPress allows you to tweak the Appearance settings of the theme and gives you a live preview of those changes. Our themes also add options to the Customizer, which let you configure various elements of the theme. You can open the Customizer by clicking on Appearance → Customize in your WordPress backend. You can also use the Customizer by clicking on the Customize link underneath the theme screenshot on Appearance → Themes. You can also click on the Customize link in the WordPress toolbar in order to open the Customizer. By default, WordPress adds following sections to the Customizer. You can change the site title and description here, and upload a custom logo image. This section allows you to upload a custom header image. You can change the background color and image here. This section lets you choose menu positions as well as create and edit custom menus. This section allows you to add and configure widgets in the Customizer. Configure what will appear on your front page. Add own CSS code to customize the styling of your website. Our themes add a new section Theme Options for all theme settings. Depending on the theme you’re using, the section will have different sub sections. Usually there will be sections for general settings, blog and post settings as well as theme colors and fonts (with the Pro Add-on). 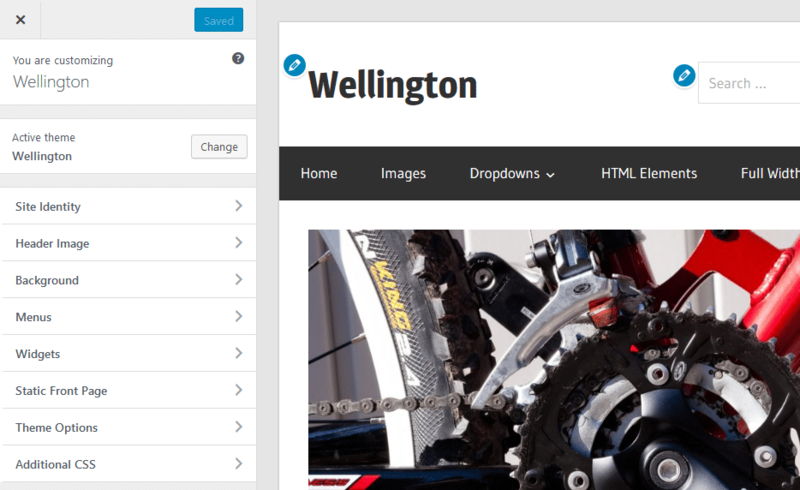 The Customizer shows all settings in the left sidebar and a live preview of your website on the right hand side. You can also click on the blue Edit icons to open the setting for this element.